Know with certainty that your messages will be received! OutVoice provides natural sounding text-to-speech voice notification and/or WAV sound file alerts to landlines, cellphones, satellite phones and other voice devices, with receipt confirmation. Control your fax costs with flat-rate faxing! Interpage's FaxUnlimited service lets you fax to all of the US and Canada for a fixed monthly fee, with no per-fax or per-minute charges! Enhance or replace your pager with DirectPage! Get numeric and alpha-dispatched messages on your smartphone, tablet, or cellphone, and/or pager, as well as on up to 10 additional devices or destinations! Have your automated equipment, alarms, and industrial control devices call only one number! Use the Interpage to accept TAP and/or Touch Tones from alarm systems and automated equipment and send messages to multiple users/devices. Need to add cellphone/SMS, email, fax and voice notification to your paging or voicemail system? Interpage can provide custom-branded messaging to existing enterprise voicemail system, to provide scheduled/filtered notifications to cellphones, pagers, email and fax without requiring any new equipment or software! Send messages to nearly any wireless device with Interpage's Messaging and Paging Gateway! Mobile phones, wireless devices, alpha pagers and numeric-only pagers can all be notified using a single messaging gateway and simple commands which are easily integrated into any web/cloud based application, messaging software, or internet-connected device. Or call us at +1 (650) 331-3900 during US Pacific Business Hours. We will be happy to answer any questions you may have concerning our faxing or other services! Thank you for using Interpage's FreeFax (sm) service! Interpage's FreeFax Service lets you measure the speed and reliability of Interpage's fax services. We do NOT use fax numbers entered for future solicitations nor is any information sold to outside sources or used for marketing or tracking purposes of any kind. The FreeFax service is solely provided as a means to evaluate Interpage's fax-based services and is otherwise unsupported. Please see our NO TRACKING policy for details. This is a free service offered by Interpage to demonstrate and promote our fast, robust, and reliable fax-based services. Using this service, you may send a fax for free to any US/Canadian, Western European, New Zealand, or Australian-based destination to test out your fax machine and Interpage's fax services. 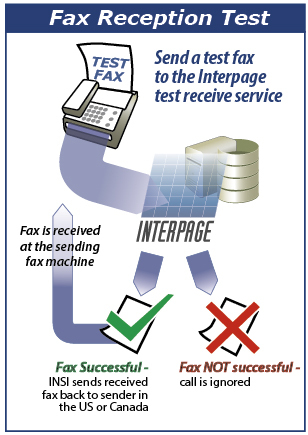 Interpage will wait for 120 seconds after you click "Send" so you can make sure your fax is connected and ready to receive, and then send a test fax to the number you entered. Parties interested in establishing a free, week-long, limited-use fax trial account may fax or scan/e-mail a non-billing (free) trial form back to Interpage; verification/activation of the free trial account will generally occur within one business day of submission. If you do not hear back from us, or for any other question or matter, please contact Interpage during business hours at +1 (510) 315-2750, or at any time via our Web-based inquiry page. Enter the destination fax number in the box immediately below. US/Canadian numbers should be 10-digits, without any spaces, dashes, or brackets. Thus, to send a fax to (213) 555-1212, please enter "2135551212" (without quotes). International faxes require "011" first, with no leading "+", so that +44 (207) 555-1212 would be entered "011442075551212". Please enter a single alpha character or number which will appear on the cover sheet of your fax. This character/number may be used to correlate a given fax's transmission time with it's reception at your test location(s) to time throughput and speed. Please enter your text message below. NOTE: Due to potentially malicious prior use of this service, no part of the text box below will be transmitted for this service; interested parties who wish to use the variable text/document OutFax service should contact Interpage for a signup form and trial account. If your destination number, recipient, and message are all correct, please click below to send your fax. For a complete list of Interpage's Free Test Services, click here. Free fax machine or fax service send/receive test service! The Interpage Fax Test Receive service allows you to send a fax from your fax machine or fax service, and Interpage will capture your CallerID, receive the fax, and if the fax is properly received, re-transmit the fax back to you at the number from which it was sent. To use the Fax Test Receive service, send a fax (of no more than 5 pages) to (650) 530-9014 from the fax machine or number where you want the test fax re-sent to you. If the fax is successfully received, a copy will be sent back to you, with an explanatory cover sheet from Interpage. The received fax will appear exactly as we received it, and can be used to guage the quality and appearance of faxes which your fax machine or fax service sends. A static, non-tabbed Re-Fax instruction page is available here. As with all Interpage free fax/test services, information obtained in the test reception and retransmission process is not used for marketing purposes, sold, or used in any way other than in furtherance of the completion of the fax reception test; please consult the Interpage Privacy page for details. Send a free test SMS or Page! The Free Test SMS/Page service sends test SMS messages to the phone from which you are calling from, or to most US/Canadian Alpha Paging Systems. Additional information is available on the SMS/MMS Test Service and Interpage Free Tests Main pages. 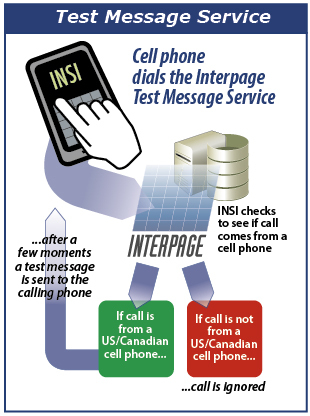 The Test SMS/MMS/Text messaging service may be accessed from any US and Canadian cellular phone by dialing (650) 456-4556 from the mobile phone to be tested. Callers should follow the instructions and menu prompts to select their carrier, after which their desired type of text or MMS message will be immediately sent to their phone. TAP Alpha Messaging reception to SMS/e-mail. The Voice Test Service, part of a demonstration of how Interpage's OutVoice Service and Voicemail System function, allows callers to record a brief message which is in turn played back to the number from which the message was left. ...and follow the prompts to leave a message with the Voicemail Service. Within a few moments, the OutVoice Service will call back and replay the deposited message. Latency Test: (802) 359-9100 - Listen for Voice-over-IP and digital cellular induced delays and latency (as compared to traditional landlines). Number Readback/Telemarketer Block: (614) 448-1122 - Calling number readback in the format of a Bell System "not in service" recording, which can also be played to telemarketers and unwanted callers to appear that their (the calling) number has been disconnected. 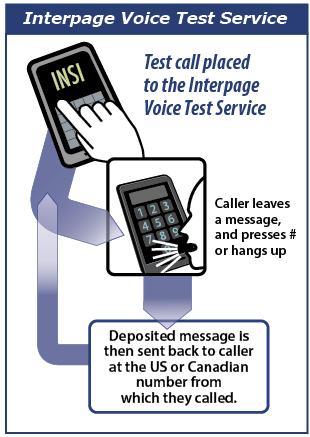 For additional information on Interpage's free test, or Voice, Messaging and IVR services, please visit the Free Test Services or the Voice Services pages. Send a test fax for FREE to anywhere in the United States/Canada, most of Western Europe, New Zealand and Australia! The FreeFax service sends a free, three-page fax as a test - just enter the fax destination in the blue area below. Additionally, LobbyByFax allows you to send a free fax to your Congressional Delegation about a variety of current issues, or create a letter of your own by selecting the appropriate link from the green-boxed area. Send a free fax to Congress with LobbyByFax! Let your elected officials know what you think! Send a free fax to Congress or your State Legislature with Interpage's LobbyByFax service using either a pre-composed letter on current issues, or write your own letter to Congress and/or your State Representatives using the LobbyByFax.com blank form. Sending a free fax to Congress via the Interpage/ LobbyByFax system should take only 30 seconds or so, and we do not track, market, sell, or contact you in any way, so please take a few moments and tell your Congressional and/or State Representatives what you think!